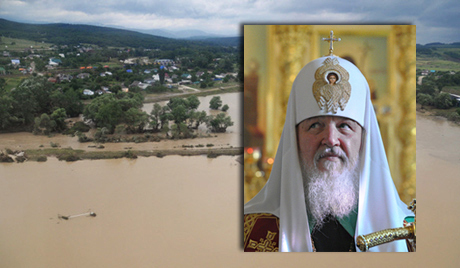 Visiting the flood-stricken town of Krymsk Monday, Patriarch Kirill led a memorial church service for the flood dead. He also inspected the Church-led aid operation in Krymsk and presented a local school with vouchers to acquire equipment for its canteen. The latest Krasnodar floods struck in the small hours of July 7, destroying some 7,200 houses in Krymsk, Gelendzhik and Novorossiysk. They claimed over 170 lives, including at least 150 in Krymsk. The Russian Church has collected over 14 billion roubles to buy emergency aid items for Krymsk. Its aid operation there is headquartered at the town’s Church of St Michael.